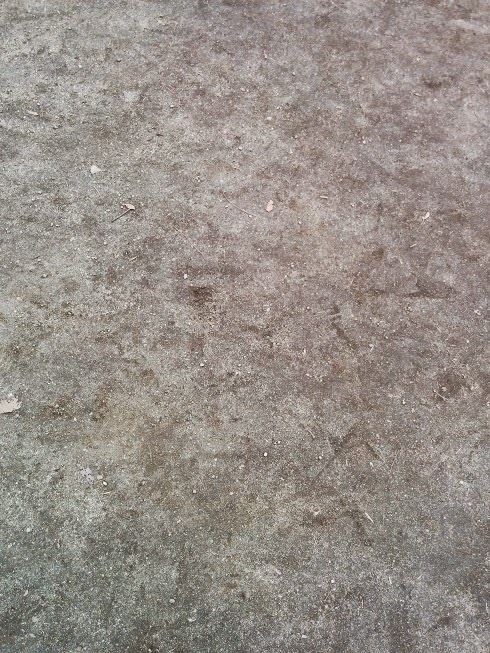 Playground (2015). Image by MTC. and failure's no success at all. It was not a terribly good weekend for Democratic Party of Japan leader Okada Katsuya. 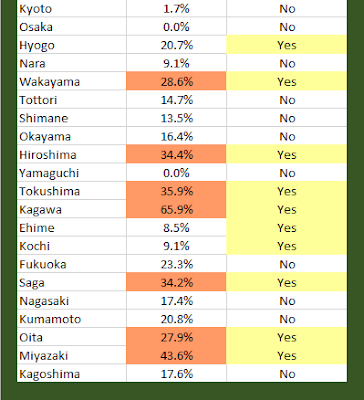 Liberal Democratic Party/Komeito coalition-backed candidates won 10 out of 10 governor seats up for election. The LDP came out as the top seat holder in 40 of the 41 prefectural assemblies holding elections, the sole blot on the perfect record being in Osaka Prefecture. The DPJ finished out the day with fewer total seats in the both the prefectural and the 17 specially designated city assemblies. And to top it off someone hacked Okada's personal Twitter feed on Saturday, generating a flood of spam tweets to all of those following his feed. The LDP did all right. Its candidates certainly won the governorships. 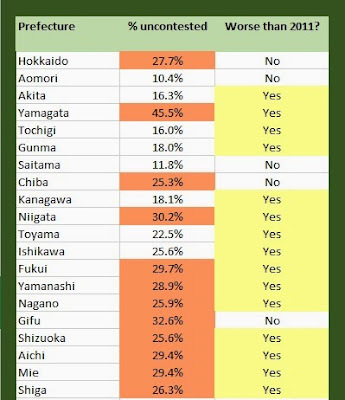 However, only two of the races -- Hokkaido and Oita -- were competitive. In truth, not even the Oita race was competitive, as in former Socialist bastion Oita former Socialist prime minister Murayama Tomiichi campaigned for the LDP-Komeito candidate, an old friend of his. The LDP raised the number of prefectures where it holds an outright majority in the assembly from 21 to 24. It finished the day with 50.48% of all prefectural seats nationwide. On the minus side, the LDP's total number of prefectural seats fell by 43 to 1153. The big winners were the Japan Innovation Party, the Komeito and the Communists. The JIP increased its national total in the prefectures from 62 to 70 seats and won a plurality if not a full majority of the seats in the Osaka prefectural assembly. The Komeito won every seat it contested on the prefectural level, going from 169 seats to 169 seats (demonstrating once again the party leadership's knowledge of its voters) and raised its seat totals in the specially designated cities from 172 seats to 174. Indeed only one Komeito candidate failed to win a seat on Sunday, coming up short in a race for a seat in the Osaka City assembly. The Communists, in many races the only opposition candidate, had a field day. The JCP blasted from 75 total seats to 111 in the prefectural assemblies. The JCP now owns at least one seat in every prefectural assembly, including the six not holding election this cycle - a historic first for the party. In the specially designated city assemblies, the JCP moved past the DPJ as the #3 party in the nation, raising its seat totals in these cities from 103 seats to 136 (the LDP is #1 with 301 seats, the Komeito #2 with 174). All the wins and losses, however, come with a caveat: voter turnout was terrible. New record lows for voter turnout were set in 38 of the 41 prefectures holding assembly votes. In the specially designated city assembly races, 12 of 17 suffered new record low turnout. On average, voter turnout in the gubernatorial elections was down over 5% from turnout in 2011, the one big exception being the competitive race in Hokkaido. However, even in the Hokkaido gubernatorial race turnout declined, from 59.62% to 59.46%. 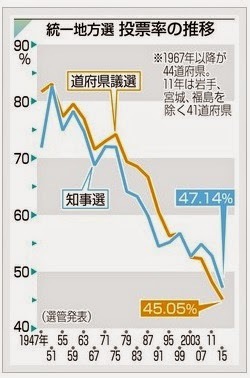 Average turnout for prefectural assembly (brown line) and gubernatorial (blue line) elections since 1947. 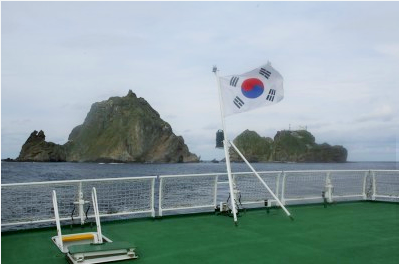 Image courtesy Tokyo Shimbun. Bad turnout of course favors the parties with strong with strong internal mechanisms guaranteeing dutiful voting by its members and clients. It disfavors, and indeed is a symptom of the weakness of, parties that rely attracting floating voters for their victories. Hence, the DPJ did as well as it should have done -- which is not well at all. In prefectural assembly elections in 41 prefectures, the total number of seats won by DPJ-backed candidates fell 82 from the previous elections to 264. Of course, the Yomiuri's editors know full well that the DPJ of 2011 is not the DPJ of today. The DPJ that ran candidates in 2011 was the big tent DPJ, before the departures of Ozawa Ichiro and friends over the consumption tax rise and the skedaddling of the mostly Kansai-based opportunists to Hashimoto Toru's Isshin no kai. 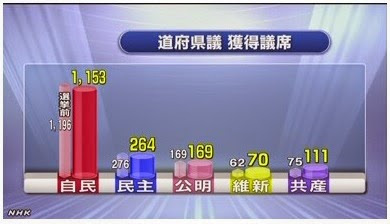 shows that the DPJ was defending only 276 seats on Sunday. The party's candidates won 264 prefectural seats, a decline of -4.3% in the national total. The purported big winning LDP (for that is the way the Yomiuri characterized the LDP's results in its English-language edition) was defending a 1196 seats total. Finishing with 1153 means a decline of -3.6% nationally. Not that dramatic a difference if you ask me. The latter is easy. The former, however, is hard. The DPJ rode in blissful ignorance on the escalator to power in 2009, propelled upward by a 25 year cycle of "Anyone But The LDP" public revulsion at Japan's ruling party. When being just "anyone else" is sufficient for victory, one can be, as the DPJ was in 2009, just a pale-lipped copy of the LDP, with the LDP's political DNA still visible beneath the overlay of an opposition party. We now live in an era of "One Strong, Many Weak" (ikkyo tajaku). A superpowerful LDP feeds off of and encourages lower voter turnout, resulting in Japan's wild deviation from Duverger's Law (don't laugh at the link). For the DPJ to become more relevant and for democratic processes to revive Okada and his loyalists have to come up with popular policies, not just popular-sounding policies. The party has to nurture a generation of new politicians while submitting its existing apparatus and message to rigorous and regular testing. Otherwise, this happens -- and will keep happening. The effort may be futile. As I have stated any number of times, a hard conservative Abe Cabinet and LDP, running the loosest and most liberal economic policy in the developed world leaves very little room on the political spectrum for the DPJ to plant its flag on. However, if the results of Sunday demonstrate anything to Okada and Company, it is that the DPJ's present path and strategy have no future. Change or decay -- it will be one or the other. With this, I will be taking a break from regular posting for a while. I need to devote my energies to a new venture. I may pop in and out every so often, if changes in the political climate merit comment. Time, as Robert Allen Zimmerman would have it, for my boot heels to be wanderin'. Jeffrey Kingston of Temple University Japan has quoted me copiously in an opinion article published in The Japan Times (Link: Abe gets negative reviews ahead of U.S. visit). The quotations are certain to make me persona non grata in the Kantei. I am grateful for Professor Kingston's quoting me. The quotes are verbatim. However, I disagree with characterization that my overall assessment of Abe is negative. Prime Minister Abe Shinzo is not really the majority of the population's idea of a dream date. The PM lacks most of the commonly recognized personality traits and qualities of a successful politician. Nevertheless, his Cabinet is the most reliably popular one for three decades. Abe is also fully back from the political Siberia his illness banished him to in September 2007. For four years he wandered the halls or slumped in his seat in the upper reaches of the House of Representatives, a weird ghostly figure. His resurrection and return should be the stuff of legends. As for "Abe Magic" and the "Abe Paradox" in the article -- again, correctly recorded -- these simple phenomena observable in the public polling data. They are also two manifestations of a single astonishing achievement: the conjuring up of a sense of inevitability to Abe's continued rule despite his inability to convince the majority of the voters to support whatever it is he is planning to do. Are the voters so starved for stability in the prime minister's spot that they are willing to say they support a Cabinet whose policies they do not like? Not at lot has gone really right in Abe's second stint. The economy is still weak; the monetary carpet bombing of the land with yen has not resulted in zero inflation; the collective self defense proposals are a spaghetti bowl of promises (and way behind schedule); Okinawa is in open revolt. However, it is year three, Abe is still here and he is sticking to his much delayed agenda. He is letting all the hardships, bad news (the Algerian gasworks attack; the Hiroshima landslides; the murder of Goto Kenji) and missed targets roll off his back. Of course, a PM with a majority in the House of Councillors and a supermajority in the House of Representatives should be invincible. Abe's successors, from both LDP and Democratic Party of Japan, have shown how it is possible to fail in this blessed land's top office despite controlling more than the requisite number of seats in both Houses. Abe succeeds despite himself. That is not negative. It is amazing. 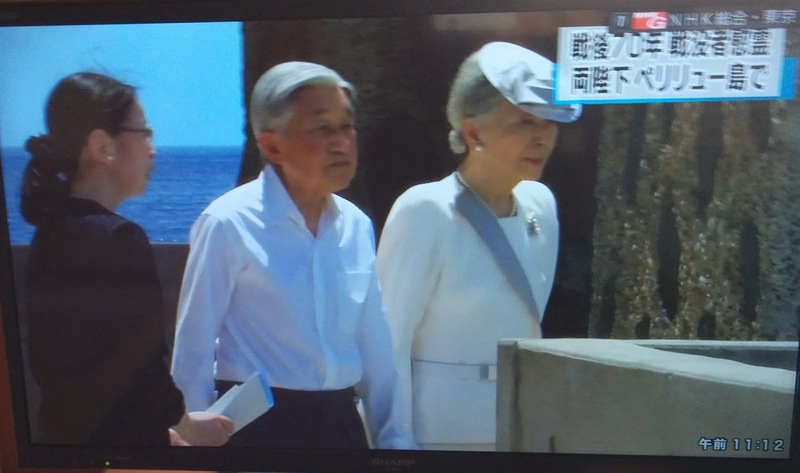 3) That it is the Vice Minister of Health, Labour and Welfare presiding at the commemoration events at the newly refurbished memorial on the island of Peliliu, not the Vice Minister of Foreign Affairs -- making it crystal clear once again that it is the MHLW, not MOFA, that is in control of war memory in Japan. A startlingly high fraction of this blessed land's prefectural, local assembly and mayoral seats go uncontested. In the last Unified Local Elections cycle in 2011 about 40% of electable positions were awarded without a vote, a figure raising serious questions about just how democratic Japan's democratic system of governance is. On Friday, the candidate lists for the 12 April 2015 prefectural assembly elections came out. The Bad News is that the previously low level of competition in the prefectural assembly races has for the most part deteriorated. A record 21.9% of the seats will be awarded without an election, the highest level of non-election since the establishment of the current local administration system in 1947. In 321 electoral districts – ONE THIRD -- of the 960 total electoral districts (some districts award more than one seat) -- there will be no voting. In Kagawa Prefecture, 27 of 41 seats -- 65.8% -- will be awarded without contest. In 25 of the 41 prefectures holding elections the number of seats going uncontested is worse than in 2011, which was an election held in the immediate aftermath of the Great Tohoku earthquake, tsunami and nuclear disaster, a time when the eastern half of the country was still experiencing acute shortages in basic goods and services and the national mood was somber and subdued. 3) in Yamaguchi and Osaka there are to be elections for every seat – whereas in 2011 no prefecture had zero uncontested seats. Oh, maybe participate, someday. Just not today. A non-appearance (phone only) appearance on Channel News Asia. Monday's collapse of service on Tobu Railways's Nikko Line (memo to me: I think* Tobu Railways is an absolutely terrible company) left me far from my computer and Skype, with the battery on my phone at near empty. With the recording window immanent, I stepped off the train at X Station, went to the local Major International Coffee House Chain outlet, bought a mug of coffee, plugged in my near dead phone into one of the complimentary electrical outlets and asked to talk to the manager. Manager Y was a magnificently self possessed young woman, who at no point seemed fazed by a crazed, backpack-toting hiker babbling about doing a smartphone Skype broadcast from her store. She had me explain twice what I wanted to try to do, told me that company policy allows no video recording without explicit permission from headquarters -- so a Skype call with video was a no-no -- but if I wanted to talk on the phone to a international television network about South Korea-Japan relations in the 50th anniversary year of the establishment of diplomatic relations between the two countries, sure, she would be happy to turn down the volume of the music in the packed store for the quarter-to-half an hour I might be talking to the host in Singapore. Which is what she did. Thanks also to the network, for their flexibility, patience and professionalism. The staff improvised, pulling down from the Web the picture of me from almost a decade ago and pasting it to a photo of Mt. Fuji with cherry blossoms (full disclosure: I am not a big sakura fan) to make up for the lack of a Skype video feed. Please check out the result. * My friends with legal backgrounds have explained to me that sticking a superfluous "I think" in front of a statement makes it an opinion and thus not legally actionable. Not having the "I think" (it is my blog, who else would be doing the thinking?) could be considered either slander or libel. The latest installment of Langley Esquire's "Tokyo On Fire" series of YouTube videos/ITunes podcasts on burning issues in Japanese politics was an incredible gas to record. I was forever at the brink of talking way too much (Since when have you ever had a sense of proportion in matters pertaining to Japanese politics? - Ed.) but was pulled back by presenter Timothy Langley and fellow guest Dr. Nancy Snow.